Want to find out how Pro E software has helped customers improve design processes and efficiencies? Take a look at the following Pro E software case studies to see how Pro/ENGINEER has helped them to enhance their product development. Eton SRF manufactures enhanced cooling systems for industrial, automotive, and agricultural applications. Product design teams are based in the United Kingdom (Midlands & London) and Turkey. SRF Manufacturing is located in a 20,000 sqm facility in Manisa, Turkey. Paul Heatherington is Lead Designer at Burnside Autocyl (Tullow) Ltd., a manufacturer of hydraulic cylinders in Tullow, County Carlow, Ireland. 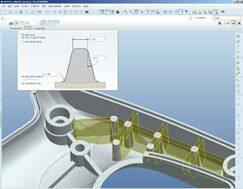 The company implemented Pro E Software when making the move from 2D CAD to 3D CAD in 2005. Vax is the number one floor care brand in the UK, and is known for its heritage in the carpet-washing sector. Originally designed and manufactured in the UK, the first Vax machine was truly innovative as it not only vacuumed carpets, but it also washed them and sucked up spills. This transformed the way consumers cared for their carpets. With an unwavering commitment to quality and innovation, Firth Rixson has become a leader in the forging industry, providing man- ufacturers with rings, forgings and metal products. Today, Firth Rixson serves as a “one-stop shop” for original equipment manufac- turers located anywhere in the world. The company has experienced double-digit growth over the last three years thanks to a strong global economy, effective acquisitions, smart divestitures, and wise investments. Firth Rixson’s products and services not only set the standard for quality, but also for on-time delivery and price. SPP Pumps of Coleford, UK has been designing and manufacturing pumps and associated equipment for well over 100 years. The company has been supplying the Oil and Gas industry since 1970, when SPP pumps on the Argyll platform brought ashore the very first oil from the North Sea. Since then, SPP’s experience in the North Sea has enabled the company to supply equipment to the most extreme environments around the world.